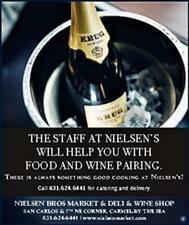 Nielsen's staff is available to help you with your food and wine pairing. With our award-winning import and domestic cheeses and wine selection, our Market is the go-to-place and where: "There's always something good cooking!" San Carlos & 7th, N.E.C.